[Poster for Harper’s New Monthly Magazine, Jan 1899]. Man driving horse-drawn sleigh. Color lithograph. New York: Harper & Brothers, published Dec 1898. Inscribed upper left, in horse’s bridle: bull’s head monogram 19 1/4" w. x 11 1/2" h.
Ref: DFP, 397; Gibson, pg 27; Lauder, 217; PAI-2, 90; PAI-10, 358; PAI-21, 369. [Poster for Harper’s New Monthly Magazine, Feb 1899]. Portrait of Senator Henry Cabot Lodge. Three-color lithograph: brown, black and orange. New York: Harper & Brothers, published Jan 1899. Unsigned. 8 3/8" w. x 17 3/4" h.
Ref: DFP, 398; Lauder, 218. 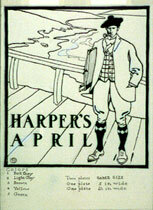 [Poster for Harper’s New Monthly Magazine, Mar 1899]. Farmer and horse plow a field, past a rooster. Four-color lithograph: brown, black, green and red. 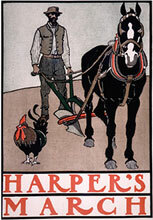 New York: Harper & Brothers, published Feb 1899. Unsigned. 10 3/4" w. x 15 3/8" h.
Ref: DFP, 399; Gibson, pg 27; Lauder, 219; PAI-9, 449; PAI-16, 415; Swann-1887, 307; Swann-1941, 359. 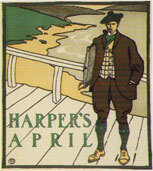 [Poster for Harper’s New Monthly Magazine, Apr 1899]. Artist with portfolio on a boardwalk overlooking the water. Four-color lithograph: yellow, grey, green and black. New York: Harper & Brothers, published Mar 1899. Inscribed bottom left: bull’s head logo. 9 1/8" w. x 10 5/8" h.
Ref: DFP, 400; Lauder, 220; PAI-27, 560. [o.p.f. Harper’s New Monthly Magazine, Apr 1899, A 74]. Pen and ink with china white on board, 1899. Original line artwork used to create the poster, has color call-outs for the inks, and sizes specified for smaller "electrotype" cuts. Ref: Original in collection of Library of Congress, Cabinet of American Illustration. [Poster for Harper’s New Monthly Magazine, May 1899]. Eight potted daffodils. Three-color lithograph: yellow, red-brown and green. 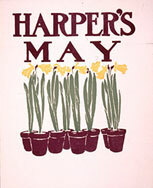 New York: Harper & Brothers, published Apr 1899. Unsigned. 8 7/16" w. x 10 5/8" h.
Ref: DFP, 401; Lauder, 221. 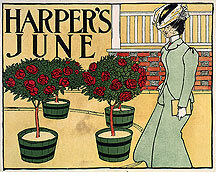 [Poster for Harper’s New Monthly Magazine, Jun 1899]. Well-dressed lady walking past four potted rose trees. Four-color lithograph: yellow, green, red and black. New York: Harper & Brothers, published May 1899. Unsigned. 13 1/16" w. x 10 3/8" h.
Ref: DFP, 402; Lauder, 222; Brandt, 76; PAI-13, 369. 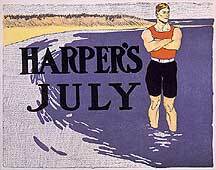 [Poster for Harper’s New Monthly Magazine, Jul 1899]. Man in bathing suit, wading at beach. Four-color lithograph: yellow, blue, vermilion and black. New York: Harper & Brothers, published Jun 1899. Unsigned. 13" w. x 10 3/8" h.
Incorrectly listed as Jul 1898 in Gibson, 11. Ref: DFP, 403; Lauder, 223; Swann-1887, 306. 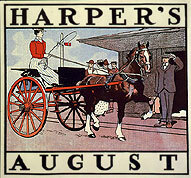 [Poster for Harper’s New Monthly Magazine, Aug 1899]. Woman on horse-drawn cart, picking up her husband at train station. Three-color lithograph: blue, black and red. New York: Harper & Brothers, published Jul 1899. Unsigned. 12 5/16" w. x 11 7/16" h.
The last of Penfield’s series almost seems to show the artist coming home from a long haul at Harper’s. Ref: DFP, 404; Lauder, 224.